The Deering Estate Foundation serves as the philanthropic arm of the Deering Estate. Our purpose and mission is to build public awareness, outreach, understanding and the enjoyment of the Deering Estate and to provide resources and assistance for the enhancement and expansion of the educational, historical, cultural, scientific, archaeological, park & recreational facilities, programs and other related services offered at, through or in connection with the Deering Estate. Mission: To raise awareness of the Deering Estate and to raise funds to support education, research, exhibits and collections and the conservation and restoration of the Estate’s natural and historical resources. Programs include historic preservation, natural resource conservation, environmental education & research, arts & culture, and building public awareness through special events. Future site of Deering's Institute for Conservation Research & Learning - A new day dawning - Gift from Marta Weeks-Wulf. Listed on the National Register of Historic Places since 1986, the Deering Estate (Estate) is a 450 acre environmental, archaeological, historical, and architectural preserve owned by the State of Florida and operated by the Miami-Dade County Park, Recreation and Open Spaces Department. The history of the Estate encompasses many cultures inhabiting the land over thousands of years. Paleo-Indians, Tequestas, Seminoles, Afro-Bahamians, and Anglo-Americans have at different times, lived here, recounting the evolution of human housing on the Miami Rock Ridge, from karst cave dwelling to Mediterranean Revival Mansion. The oldest existing buildings on the Estate are those built by the Richmond family and Charles Deering. In 1896, Samuel H. Richmond built a pioneer home for his family on the Estate as part of the settlement of the Town of Cutler. In 1900, an addition to the home was built and opened to the paid public as "The Richmond Cottage" - the first inn between Coconut Grove and Key West. In 1913, Charles Deering purchased plots 77 and 78 and established his winter home in South Florida. He remodeled the Richmond Cottage to its present appearance and built a 14,000 square foot Stone House to showcase his collection of fine art and furnishings, as well as a Carriage House, Pump House and Power House to support the property. In collaboration with FIU’s School of Environment, Arts and Society (SEAS), the Estate is gaining recognition as a world-class cultural and ecological field station, part of an international Organization of Biological Field Stations, containing one of the most diverse natural habitat, archeological, and historical collections combined in a single site. 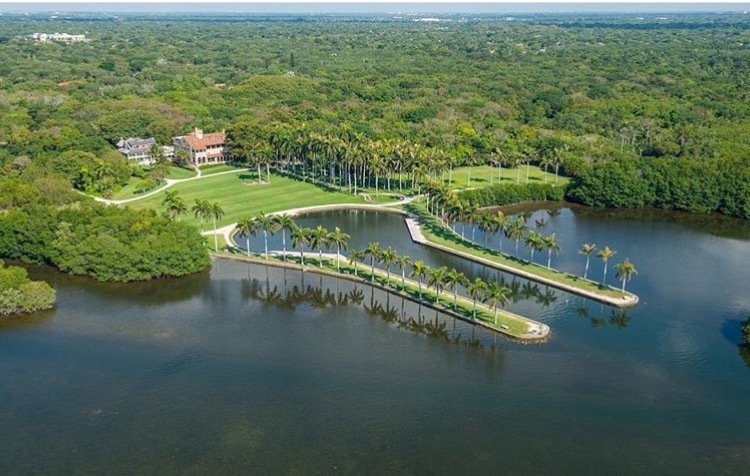 In 2015, the Deering Estate Foundation received an 8.75-acre property located adjacent to the Deering Estate from local philanthropist Marta S. Weeks for purposes of preserving the land in perpetuity and to support the ongoing development of the Estate’s cultural and environmental education programs. The property includes a 10,700-sq. ft. solar powered facility originally built in 1982 which is being repurposed to serve as the Deering Estate's Institute for Conservation & Research to house field station staff, an archival library and provide temporary living quarters for up to 14 visiting resident researchers and/or artists. Upgrades to this facility will provide for the expansion of the Deering Estate’s environmental education programs embracing the field study needs of public universities in STEM related curriculums as well as targeted professional research, while also providing enrichment opportunities for the Estate’s existing K-12 experiential learning programs. The Estate seeks to continue Charles Deering’s legacy of art patronage by supporting established and emerging arts institutions, collaborative groups, and individual artists. In 2006, we began to invest in the development of programs specifically designed to engage local and international, visual, literary and performing artists to interact with the community through the founding of the Artist in Residence (AIR) Program. Originally housed in our historic buildings, the Carriage House and Pump House, the program now takes place as an integrated element of our unique site – a full collection of 5 historic buildings, outdoor spaces with native South Florida eco-systems, grounds with views of Biscayne Bay, the Visitor Center Theatre and Exhibit Room. The residency has grown to include the founding of our Chamber Music Ensemble, newly defined Studio and Project Residencies with theatre collaborations, playwright presentations, composers in residence, and our premiere choreography residency project. Serving as a hub for collaborative cultural arts programming as well as an incubator for annual cultural and educational events, the AIR program offers artists time, space and resources to create site-specific works, enriched personal practice, and experiences that create awareness of the Estate through interactive programs with curators, scholars and the greater community. The Deering Estate serves as a "Living Classroom" for over 18,000 K-12 educators and students annually, offering unique, award winning STEM+Arts experiential learning programs. On-Site Field Study Trips led by the Estate’s Education and Interpretive Staff provide students the opportunity to learn, hands-on, about South Florida’s rich heritage and natural resources, while focusing on topics such as archaeology, ecology, biology, marine science, and earth science. All Field Study Trips include web-based, pre and post activity guides, interactive tours, on-site projects and can be modified to fit particular classroom objectives. The Deering Estate’s N.E.S.T.T (Nurturing Environmental Stewards of Today & Tomorrow) program brings best practices in using sites to teach into the formal classroom setting. Twice weekly for thirty weeks during the academic school year, students receive onsite and in-class STEM+Arts instruction from the Deering Estate’s Education and Interpretive Staff, which includes an onsite field study and lab trip to apply many of the science, math and reading topics learned during that week’s curriculum unit. Curriculum includes lesson plans, activities, fossils, specimens and materials for studies in ecology, biology, marine biology, geology, archeology, history and environmental science and helps educate students about preserving our biodiversity through environmental stewardship, environmental sustainability, and overall resource management. Produced by the Deering Estate Foundation in collaboration with a whole host of partners and held the last Sunday in March each year, the Deering Seafood Festival has become one of South Florida's top rated annual signature events drawing nearly 10,000 guests to the Deering Estate annually. Dubbed as the Foundation’s largest “friend raiser”, the Deering Seafood Festival is specifically designed to appeal to a broad and diverse audience in search of outdoor family-friendly fun, delicious food and entertainment showcasing the best of South Florida: bay breezes, sunshine, fresh seafood, art, culture and history. The objective of the event is to drive tourists and residents alike to the Deering Estate using the allure of fresh seafood and fun so they can discover and enjoy this wondrous legacy to the cultural heritage of South Florida and learn about all of the many programs that are offered throughout the year. Learn more about The Deering Estate Foundation, Inc.